I love a healthy diversity of opinions. It keeps the conversation colorful and our minds on their toes. However, I’m not one to enjoy being misunderstood and then disagreed with. Recently, I was told of a blog that mentioned my presentation to the PRSA wherein I purportedly implied that Social Media was a Silver Bullet. This is hilariously incorrect. Not only do I know that Social Media is not a Silver Bullet, but also I don’t believe in Silver Bullets. I learned decades ago as a consumer product reliability engineer never to make absolute claims. You will eventually eat your words just about every time. Don’t ever trust a silver bullet unless it’s coming out of a barrel at you. In general, there are NO Silver Bullets when it comes to dealing with people. We’re all too (wonderfully) diverse. 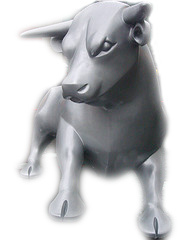 If someone is crying out about a Silver Bullet, I promise it’s nearly pure Silver Bull. See you in the conversation! Photo courtesy of a Tim Ellis derivative. Thank you Tim and Creative Commons.